I Love Italo Disco Legends, brings together many of the Dance titles most genuine and sought after by collectors around the world in this new collection are gathered a wide variety of versions that mostly are unpublished, including remixes, dub, instrumental, rarities. 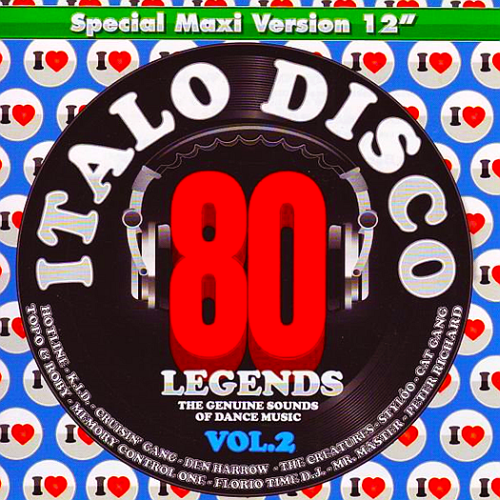 Italo-Disco consists of English pop vocals ( over mid-tempo, heavily synthetic disco or hybrid disco-electro rhythms, with emphasized lead synths. It was mostly produced by Italians. This style scene is said to have been named by to market licensed releases and numerous compilations, although not always strictly Italian productions. Thus, the term is sometimes used more broadly to describe dance music from outside of Italy and from different eras and in more diverse styles.